Previously announced Positivus Festival artists will be joined by the hottest British electronica up-and-comers East India Youth, Iceland’s dreamy indie-electro band Vök, Britain’s new indie rock darlings Peace, American new wave revivers Public Access T.V., Sweden’s melodic songstress Jennie Abrahamson, British singer Indiana, the intimate electronica project Tropic as well as Denmark’s electro-duet Rangleklods. 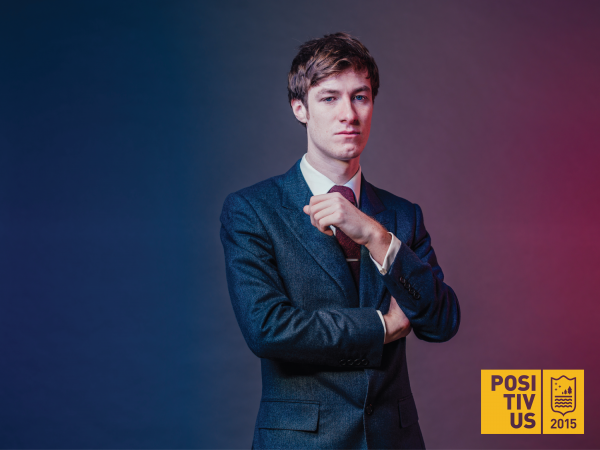 The young English electronic musician William Doyle is better known for his stage name East India Youth. The release of his sophomore record Culture of Volume (2015) caused quite an uproar amongst Britain’s leading music critics; The Guardian, NME and others have rated the album on the high-end scale of the quality music spectrum, with many comparing his creative endeavours to those of Berlin-era David Bowie. Doyle skilfully fuses glistering commercial pop-worthy melodies with elements of electronic noise and techno, 80’s synth-pop and deep drone bass, creating a sensation of a mythical, distant dimension. His critically acclaimed debut album Total Strife Forever (2014) was nominated for that year's Barclaycard Mercury Music Prize Album of the Year award. English indie-rockers Peace channel so much positivity in their music that Britain’s Independent has crowned them “Indie’s new kings show[ing] the power of positive thinking.” Peace are currently not only following in the footsteps of Brit-rock giants Blur and Oasis, but are also leading their own indie revival, with light-hearted and seemingly effortless rhythms and cascading guitar riffs. Proving that a simple smile and genuine joy are the best mood boosters, Peace always leave their audiences energised and electrified even long after their set. Reykjavík’s new experimental indie-electro up-and-comers Vök have become one of the hottest musical discovery both in their native Iceland as well as abroad. The trio will be a breath of fresh air for those seeking intellectual, emotionally secluded music that evokes a sense of unprecedented tranquility. The band is set to perform at some of the most vibrant European music festivals this summer, with Positivus Festival providing the perfect stage for their magical melodies. The freshly formed American rockers Public Access T.V. are bringing back the best of American 80’s new wave - as one of the biggest New York buzz bands of 2014, the band deliver a refreshing take on the genre, wooing audiences and music industry heavyweights alike. Having newly signed to Polydor Records, Public Access T.V. are currently working on their debut album, all the while conquering the world one crazy energetic gig at a time. With her fairy-like vocals and delicate countenance, Swedish singer Jennie Abrahamson guides her audiences through the realms of a mythical Nordic universe, with every musical note urging listeners to embark on an unexpected journey. Apart from her solo career and recent tour support for her musical idol Peter Gabriel, Abrahamson has managed to create her own distinguishable musical signature, fusing modern melodic arrangements with elements of 80’s synths. The rich musical background only accents her wide ranging powerful vocals and unforgettable timbre, with every performance an exhilarating journey through time and space. The fiercely independent yet hauntingly feminine British singer-songwriter Indiana (aka Lauren Henson) first achieved success in 2014 with her single Solo Dancing, which reached number 14 on the UK Singles Chart, releasing her debut record No Romeo in early 2015. First discovered by Grammy-nominated composer and songwriter John Beck, Indiana has since been dubbed “one of the UK’s most hotly tipped new voices” by The Guardian. Juggling with concepts of strength and vulnerability, Indiana delivers masterfully created electro-pop soundscapes which translate into an ethereally captivating and heartfelt live performances. The 22-year-old London native multi-instrumentalist Chris Wardis perhaps most notable as the producer, writer and performer for his band Tropics. Eloquently balancing his affinities for vintage synths, electric bass and percussions, Ward bears his soul and heart’s contents for the world to hear, matching his heartbeats to the rhythm of his music. Together with the live band, Ward’s mixture of synth-pop and lounge jazz creates a diverse and multi-layered electronica landscape filled with topics of longing, loneliness and desire. Since the birth of Danish electro duo Rangleklods, Scandinavians can now claim to have their own 21st century Joy Division-esque band. Their electronic landscapes combine charismatic synth-pop vibes and ambient continuity with revitalising electro-pop and heart piercing vocals. Turning their performances into unique adventures, Rangleklods guide their listeners through the exciting world of countless electronic instruments, continuously adding a new dimensions to their music. The ninth Positivus Festival will take place in Salacgrīva, Latvia from July 17th - 19th and will once again be an event of epic proportions for all quality music and wild party enthusiasts. Along with the newest line-up additions Positivus Festival will also host previously announced acts - Robert Plant and the Sensational Space Shifters, Placebo, Kasabian, St.Vincent, Basement Jaxx, Tom Odell, Jungle, Charli XCX, Lamb, Everything Everything, Fenech-Soler, Jack Garratt, Ewert and the Two Dragons, The Sound Poets, Kate Boy, King Gizzard & The Lizard Wizard, Triana Park, Max Jury and Soak. More artists to be announced. Tickets are available at www.positivusfestival.com, in all Biļešu Serviss box offices and Nordea ATM’s (in Latvia only). A Positivus Festival 3 day ticket without camping costs EUR 65,00 and a 3 day ticket with camping costs EUR 71,00. One-day tickets are now on sale for the price of EUR 35,00.